Pistachio: Holy cannoli you are my sister! Grandfather: You don't have a sister, pea brain! I'm your grandfather! Pistachio: Yes, that was my next choice. Let's face it folks, flatulence jokes are not funny. I don't care what age you are; they're just not funny. 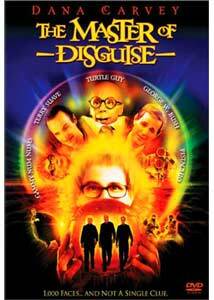 The Master of Disguise contains not only one flatulence joke, but a recurring theme of them. Sadly, this is not the worst of it. "What could be worse?" one might ask. A persistent onslaught of "Who's Your Daddy?" jokes, that's what. Normally, I enjoy Dana Carvey's wide range of quirky humor, but I have no idea what possessed him to write, much less star in, this disaster. Carvey stars as Pistachio Disguisey, a nerdy Italian waiter who, despite his not-so-clever name, is unaware of the fact that his father, Fabrizzio, (James Brolin) and grandfather (Harold Gould) were once great masters of disguise. It is only when his old arch-nemesis, Devlin Bowman (Brent Spiner), captures Fabrizzio that Pistachio is taught the family profession by his grandfather. Through this help and a cheesy pop-up book called "The Disguisey Way," Pistachio quickly learns how to utilize the art of disguise in an attempt to save his father. The resulting film is nothing more than a vehicle for showcasing Carvey's talent for character imitations, as he transforms himself into a turtle man, George W. Bush, various characters from famous movies, and a plethora of other mutations. An obligatory female sidekick named Jennifer (Jennifer Esposito) also aids Pistachio on his mission, but her presence serves little purpose other than supplying the audience with a little eye candy. Knowing Carvey's uncanny genius for losing himself within an impersonation, it is easy to see how the concept for this film may have seemed like a good idea. However, thanks to a poorly written screenplay that is marred by one pitiful joke after another, all of Carvey's usual wit and charm is lost and his talent completely wasted. There are moments where I wanted to reach through the screen and shake some sense into him, such as when he delivers a lame Shrek impersonation or rattles off Madonna lyrics for no apparent reason. Yet, in light of my despise for the film, I do have to admit to enjoying a few hearty chuckles throughout; the abundance of movie references are a hoot and several of Carvey's alter-egos are so over-the-top that I could not help but laugh at his silliness. The power of laughter may be healing, but it could not come close to curing the pain I endured while watching The Master of Disguise. Image Transfer Review: The Master of Disguise is presented in a full-frame transfer only, thereby desecrating the original aspect ratio of 1.85:1. Taking into consideration the fact that nearly all films are released on DVD in their original aspect ratio, the only reason I can think of for this travesty is that studios have somehow been given the false assumption that children are bothered by widescreen images. Out of all the DVDs I have watched with my nieces and nephews, not once have I ever heard them make a single negative remark about a widescreen or "letterbox" image. Quite the contrary, the only people I have ever heard complain about "black bars" on their televisions are crusty old adults who do not understand the restrictions of trying to squeeze a rectangle into a square. With that rant out of the way, I will go on to report that, original aspect ratio or not, the image is severely lacking. Colors are bold and bound to impress many with their strong vibrancy, but I found them to appear dreadfully oversaturated and bordering on being cartoon-like. I also detected many instances of video noise throughout, often causing the picture to appear hazy and compressed. Overall, this transfer is a major letdown in nearly all regards. Audio Transfer Review: Decent use is made of the 5.1 format with this subtly aggressive soundtrack. The mix is predominately front heavy, though when the surround channels are engaged they add a creative energy to the soundfield. Bass is satisfactory, but does not provide nearly enough "thump" as would be expected from a soundtrack filled with so many pop rock songs. Dialogue, while consistently clean and clear, lacks much of the robust quality that I am accustomed to from recent 5.1 soundtracks. Though certainly not earth shattering, the Dolby Digital soundtrack provides an enjoyable auditory experience. Extras Review: Sorry folks, but I have to go off on a rant again. Making the full-frame transfer seem even more like a slap in the face, all of the special features are presented in non-anamorphic widescreen, with the exception of the theatrical trailer, which is anamorphic widescreen! Furthermore, I mentioned before that kids do not care about the so-called "evils" of widescreen, and in my experience, they also do not give two hoots about special features. If they are to be expected to sit down and actually watch a set of extras, the material should at least be catered towards their age group. Instead of the type of fun interactive features found on Shrek or Monsters, Inc., all The Master of Disguise offers is boring featurettes and a feature-length commentary that are guaranteed to put even budding film artists to sleep. The commentary with Dana Carvey and director Perry Andelin Blake is mildly amusing. Despite all the flak they received from critics, they still seem to be very proud of their film, which is admirable, I suppose. Interesting secrets about the production are revealed and Carvey keeps the conversation light and bubbly, but I dare anyone to subject their children to this commentary. Next, are five deleted scenes and an alternate ending, each of which features a painfully unfunny introduction from Turtle Guy. All of these scenes are welcome deletions from the film, especially the horrendous alternate ending. Turtle Guy introduces most scenes by asking "I bet you're wondering..." Funny, actually, I was not. Oh, and by the way, try not to cringe too hard at the introductions that involve Turtle Guy and food. The next section consists of three featurettes. The Magic of Disguise is dedicated to production design and visual effects, Identity Crisis revolves around the casting of the main actors, while Man of a Thousand Faces focuses on the extensive makeup process and the elaborate costumes that helped give life to Carvey's multitude of characters. Also included in this section is an easter egg, featuring three minutes worth of Turtle Guy outtakes. I also should mention that each of the featurettes has their own set of outtakes as well. Wasn't the 10 minutes worth of outtakes during the ending credits enough? Featured in the Trailers section is the theatrical trailer for The Master of Disguise, followed by trailers for Kermit's Swamp Years and Little Secrets. Presented in anamorphic widescreen, The Master of Disguise trailer looks far superior to the transfer given to the feature presentation of the film. Rounding out the special features is a music video from the latest Spice Girls wannabes, Play. This upbeat girl-power pop song will probably only appeal to those who fall into the 10 to 12 age category. A comedy with very few laughs, The Master of Disguise is as tedious as it is banal. The disfigured full-frame transfer further exemplifies the unattractive nature of the film. Children may gaze at the funny-looking characters on the cover and be compelled to beg and plead their parents to buy this DVD for them. I have two words for these parents: "tough love."